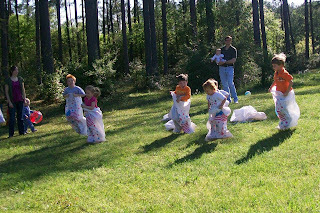 We had our 2nd annual MOPS picnic on Sunday and it was so much fun! The church grounds are so beautiful, the food was great, and we really enjoyed spending time with our friends. 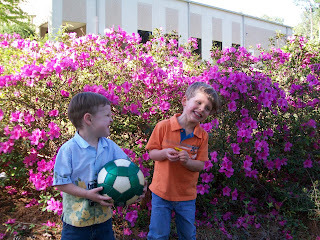 Seth and Dawson by the azaleas. 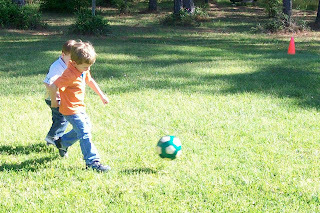 Dawson and Seth playing soccer. 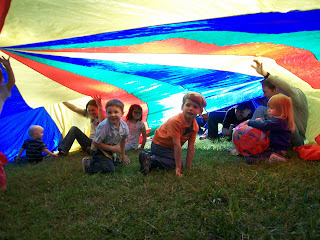 Fun under the big tarp!! 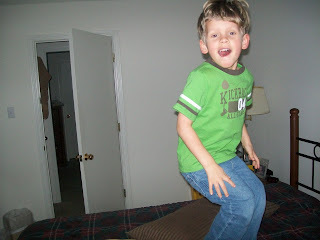 Dawson jumping in his sack. 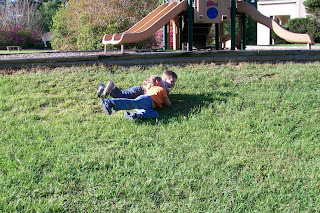 Dawson and Seth rolling down the hill - what good, simple fun. 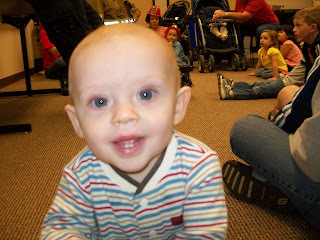 Our local MOPS group scheduled a play group at our local fire station last week. 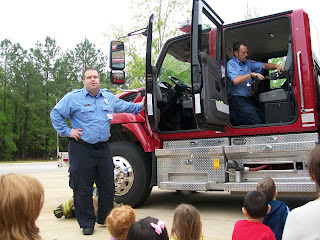 The firefighters explained fire safety, had one of the firefighters put on all of his gear, showed us the firetrucks, allowed the kids to explore the inside of the ambulance, and gave each child a cute plastic fire fighter hat. 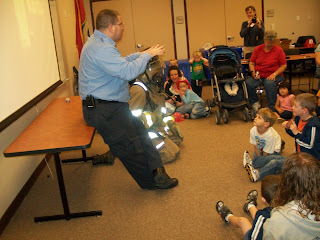 Sitting and listening to one of the firemen. Checking out the firefighter in his gear. 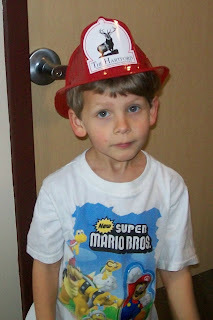 Cute little Brady inside the fire station. 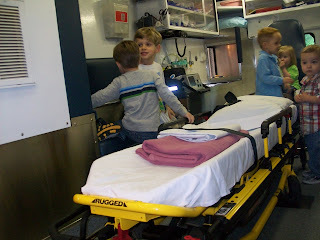 A few of the kids inside the ambulance (Dawson is on the left with his friend Seth). 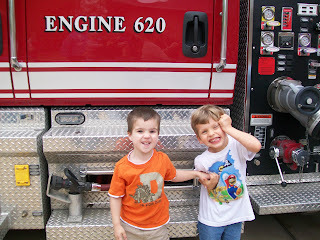 Jay and Dawson posing in front of the firetruck. 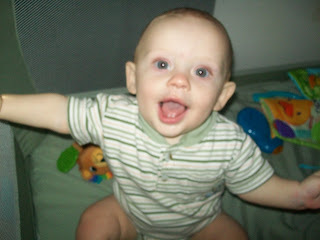 Of course, Dawson had to make a goofy face. 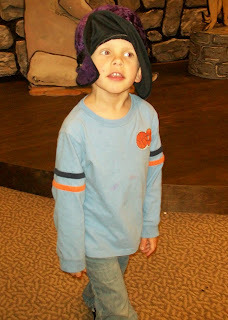 Dawson wearing his new hat. 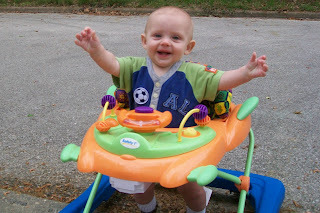 Brady really enjoys walking around in his walker outside. There is plenty of room for him to roam on our dead end street. Such a sweet little smile! 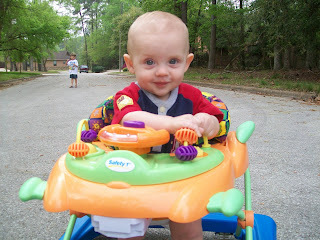 A big smile as he chased the big kids (Dawson and Kaelin) to the edge of the driveway. 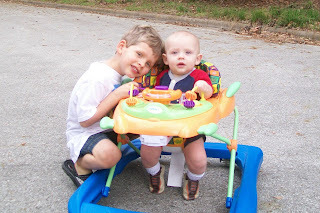 Kaelin came over for a play date the other day and she and Dawson had a great time together. 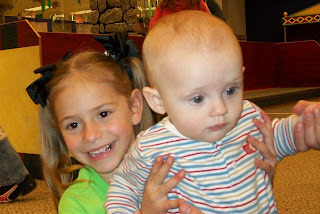 They are so sweet together!! 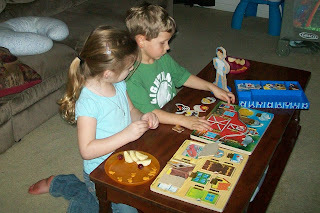 Having a snack and doing some puzzles. 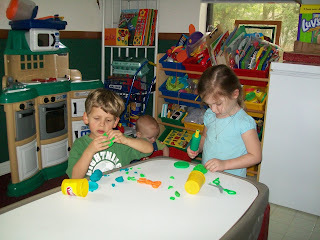 Playing with Play-Doh (Brady's in the background rummaging through the Play-Doh box). 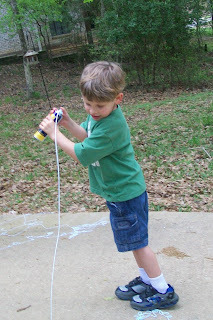 Squirting silly string. 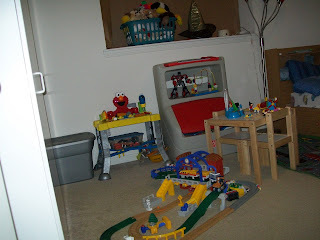 It's so fun, but is gone very quickly! Dawson watching his long line of silly string. 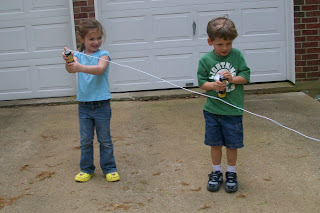 After all the silly string had been squirted out of the bottle, they grabbed it up, rolled it into balls and chased each other and me with it. 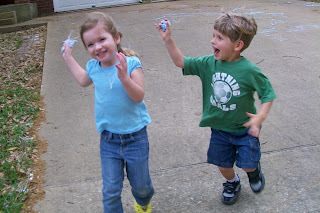 Kaelin coming after me with a wad of silly string. 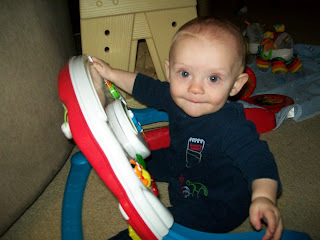 Brady spending a few moments in his Pack-N-Play with some fun toys. 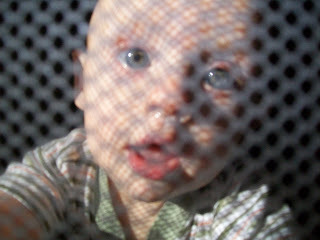 Putting his face up to the mesh. 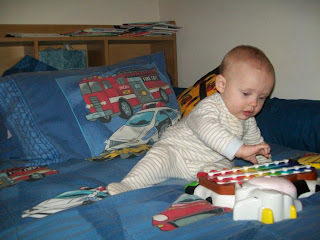 Brady tyring out the xylophone. 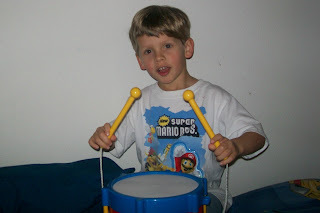 He's actually pretty good. 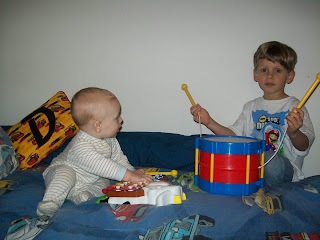 Brady eating the drum stick - not surprising as he puts everything in his mouth. 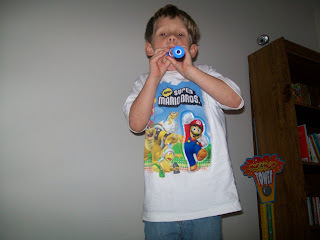 Dawson blowing on the recorder. Boy, does he blow hard and make a shrill sound. 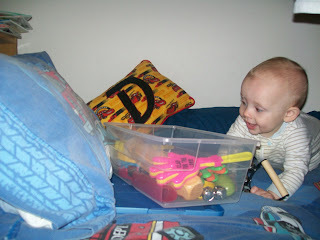 Brady happily exploring the music box. Brady sucking on his bottom lip, making a funny face. 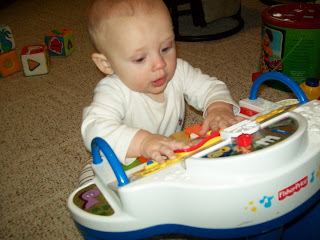 Brady playing piano at a friend's house. Thanks for sharing your toys, Lucy! 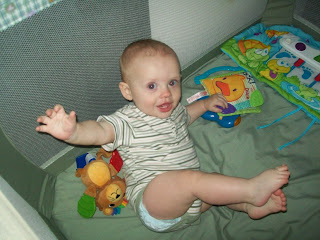 Dawson looking so big - and so cute! 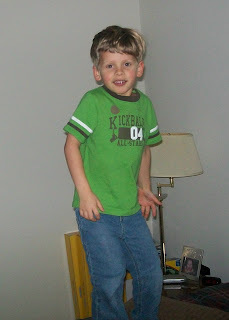 More pictures by our little photographer, Dawson. 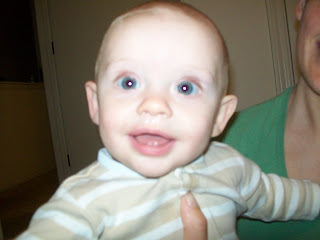 A close-up of his little brother. 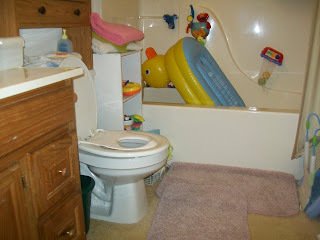 The boys bathroom, with Brady's duck upside down drying out. 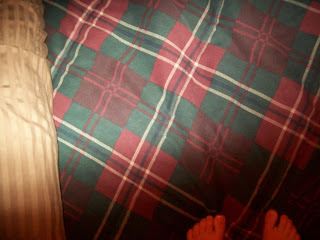 A picture he took while looking down at our bed, his little toes sticking out at the bottom. This one made me laugh. 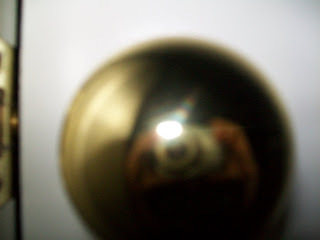 Who takes a picture of a door knob? Too funny! 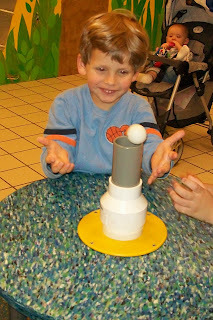 We made a trip to The Woodlands Children's Museum last week and both boys had a great time playing there for hours. 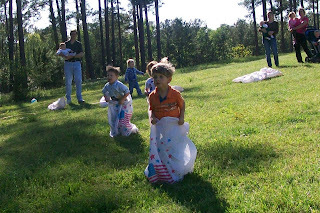 There was a big group of 1st and 2nd graders there on a field trip, which I found somewhat overwhelming with all their rambunctiousness, but Dawson was so happy following them around and playing with them. Watching the ball float above the air pipe. 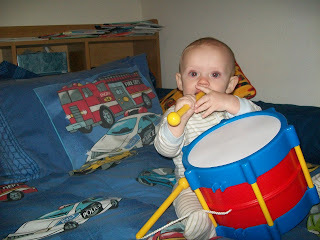 He then had a great time whacking it off. 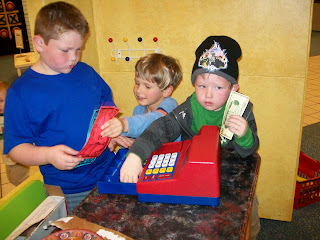 Getting some money from the cashier. 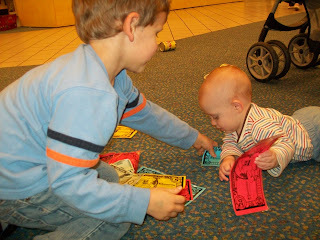 Giving some money to Brady, who loved all the colors. 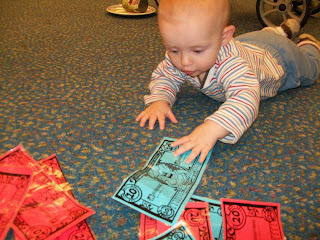 Brady reaching for the money. 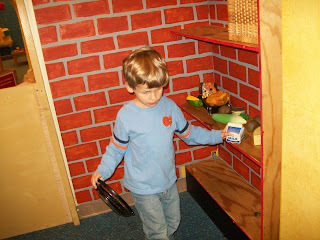 Putting groceries on the shelf of his grocery store. Looking very silly in one of the hats in the dress-up area. 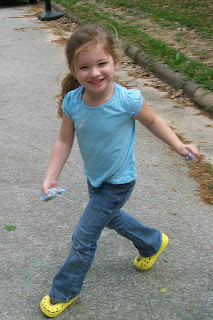 One of the sweet little girls from the class trip who took a special interest in Brady. 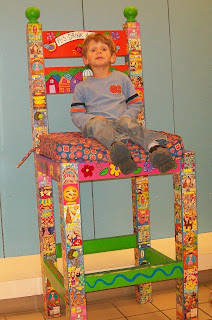 Dawson sitting in the super tall chair. 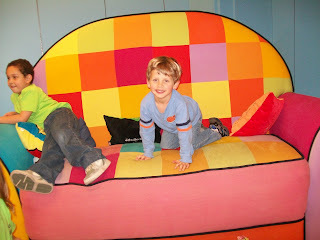 Playing on the giant couch. 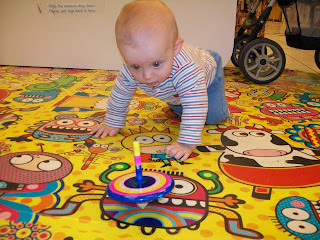 Brady loved watching these spinning tops and trying to catch them. 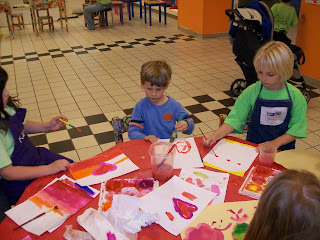 Painting a picture in the art area. 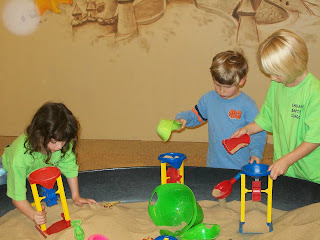 Playing in the sand room.